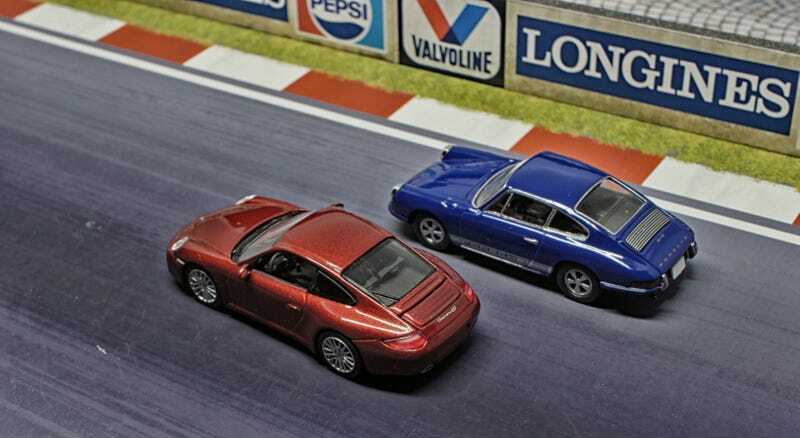 As Philipilihp told already, I was wondering about the sizes on Minichamps64 and TLVs 911s as the old swb 911S by Tomica appeared not that smaller than a MC64 997. All this last weekend on Instagram. So... Time to get out some casts. And some measuring tape! In this angle/distance the 997 appears bigger already so it could be some illusion anyway. Let’s start with the 911S. According to Carfolio it’s length is supposed to be 4163mm. I didn’t have my digital caliper at hand so this is the best I could do but by using the box to delimit the position/lines I think I came pretty close/accurate: 65.3mm. Making it’s scale... 1:63.8. Pretty close! And that’s it for today. Or should I do the 930 MBX? Well, with those rear-bumpers I wouldn’t know what to measure: With or without those (I suppose) USA bumperettes... Tschüss! !